The 7 stages of grief after a break up is usually something that you can go through very quickly, so you can then get your ex back and enjoy a new and improved relationship with her. It really depends on how you approach it. For example: You could decide to spend many months, years or even decades grieving over her and wishing that she was still in your life. If you want her back, or if you want to move on, I recommend that you get through the grief quickly so you don’t remain stuck like other guys do. To begin with, here are the 7 stages of grief after a break up. Note: These stages apply to women also, but I only help men, so this is for men. Shock: At this stage, a guy will still be trying to understand what just happened and thinking things like, “I can’t believe it’s over” or, “This can’t be happening to me.” It’s a huge shock to the system when the woman you love no longer wants anything to do with you. It can literally make you feel sick to the stomach, lose your appetite, stress, lose focus at work and so on. It’s a big shock if you really loved her and don’t want to lose her. Denial: Once the initial shock begins to calm down (anywhere from minutes to days), a guy will start to resist what happened. He may then think things like, “I refuse to accept that it’s over between us. She’s my soulmate and I just can’t lose her.” He might then text her, call her or arrive at her house to see her and try to work things out. Bargaining: When a guy gets to this stage, he begins to bargain with himself and with his ex that if he gets another chance, he will do whatever she wants to make her happy. Alternatively, he may only want to bargain with her to get her back, so he can then get a chance to dump her and walk away leaving her feeling rejected and upset. Depression: If a guy is unable to get his ex back, that is the point where he starts to feel depressed and sad about the whole thing. He may think, “It’s hopeless. There’s no point in trying anymore. She’s gone and I will never get her back. I might as well accept it.” He might also feel sad about the state of his life now that he is single. What will other people think of him (i.e. friends, family, coworkers)? How is he going to explain it to them? Additionally, now that he’s on his own, will he ever be able to find a woman like her again? Is he destined to be lonely and sad? Testing: Once the guy makes it past the depression stage and starts to realize that there are ways to get a woman back after a break up, he may begin feeling a bit more hopeful. He may then begin to test the waters and see if there’s a chance (e.g. he texts her to see how she responds). Acceptance: If a guy has been unsuccessful with his attempts to get her back and finally gets over her (this can take months, years and even decades for some guys), he will eventually feel ready to move forward without her. He will accept that what happened is in the past and there’s nothing he can do to change it anymore (e.g. she’s now married with children). So, it really depends on how you want to approach this. You can decide to get over her by sleeping with new women and moving on with your life, or you can learn how to get her back and then do that, so you can put an end to the grief and enjoy a new relationship with her. A guy can get his ex woman back within days if he gets rid of his neediness and desperation and accepts the break up as quickly as possible (i.e. proceeds to stage 7, Acceptance, pretty much right away). It’s not easy to do, but if you can do it, you will feel stop feeling needy for her and as a result, when you interact with her, you will naturally begin to say and do the right things to make her feel a renewed sense of respect and attraction for you. However, if you’re still stuck at Denial, Anger or Bargaining and you try to get her back, you will naturally behave in ways that are a turn off to her, no matter how much you try to hide it. Why will she feel turned off? Women are not attracted to desperation and neediness in men. Women are attracted to emotional strength and emotional independence in men. So, when your ex can see that you have quickly become an emotionally strong, emotionally independent man, she will naturally feel a renewed sense of respect and attraction for you, even if she doesn’t openly admit it. If you know what to say and do to get her back, you can then proceed with that and get her back. 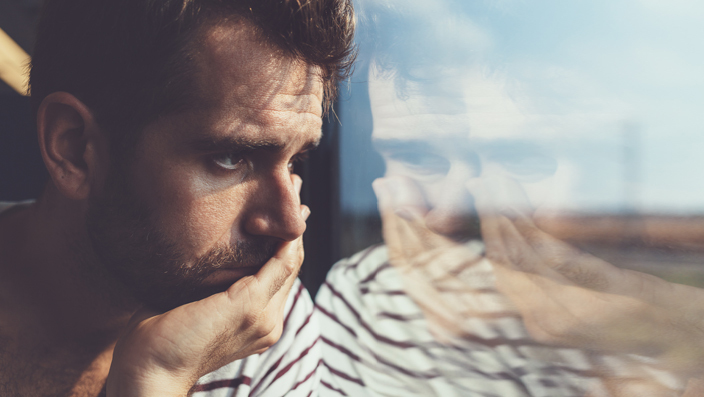 Sometimes, a guy might find himself stuck at one of the levels of grief after a break up (the most common places to get stuck are in Denial, Anger, Bargaining or Depression). As a result, he will need than just a few days to get a hold of himself and start the ex back process. However, although it’s perfectly fine to take a bit of time to recover, don’t wait too long and then risk losing her if she decides to move on and hook up with another man. If you want to speed up the process of recovery, then watch this (it’s my program, Get Your Ex Back Super System). In some cases, a guy will struggle to get a hold of himself after a break up. He will be an emotional mess and to him, it will seem next to impossible for him to feel anything other than desperately wanting her back, feeling sad and lost without her and so on. As a result, he will remain stuck at the stage of Depression. He will feel sad about losing her, depressed about his position in life (i.e. a guy who got dumped by the woman he loves and now doesn’t want to love another woman as deeply) and down about how he couldn’t keep the relationship together. This can result in him getting into relationships with women that he’s not fully attracted to, just so he doesn’t fall in love. Alternatively, he will meet a woman he is attracted to, but he won’t allow himself to fall in love with her because he wants to protect himself from getting hurt. Yet, by doing that, the relationship isn’t based on an enjoyable, loving, fulfilling emotional connection, so it feels awkward, boring, forced and stale. Eventually, the woman breaks up with him and he’s back being single again. As a result, a guy like that can ends up losing confidence in his ability to keep a woman in a relationship, which may result in him always wishing that he could just get his original ex back. He might regularly look at her social media pages just to feel connected with her, but she will always seem to be in a relationship or he won’t have the courage to contact her and arrange a meet up. So, if you want to get your ex back, you need to make sure that you get through the 7 stages of grief as quickly as possible. The longer you take, the more you increase your chances of losing her to another guy, or for you and her to grow apart so much that you don’t feel like you want to connect again. When a man gets lost somewhere in the early stages of grief after a break up, he will naturally end up saying and doing the kind of things that will turn his ex woman off. Yet, the very fact that he’s bargaining with her by promising to do whatever she tells him, only backs up her feeling that he’s not the right man for her. Women aren’t attracted to desperation, or to men who want to be told what to do by a woman. Additionally, when a woman has disconnected from her feelings of love, respect and attraction for a guy, him trying to talk her back into a relationship simply doesn’t work. She doesn’t have feelings for him anymore, so she doesn’t really care about his promises to change and do whatever she wants. No matter what he says, it just doesn’t hit the mark with her because she doesn’t feel attracted to him anymore. So, if you want to get your ex back, getting past stage 4 (Bargaining) is crucial. Passing that stage allows you to begin interacting with her in ways that are attractive to her (i.e. you stop bargaining and you start making her laugh and smile and feel good to be around you again. You focus on re-attracting her, rather than trying to convince her to give you another chance). When you change how she feels, she naturally changes her mind and opens back up to you. He might then go around expressing his grief to anyone who might listen. For example: He might talk to mutual friends about how sad and depressed he feels , in the hope that they’ll tell his ex and she’ll feel sorry for him and contact him, or open up to him again. He might also post sad quotes on social media, or lonely photos of himself to let his ex know that he is missing her. Yet, it just doesn’t work that way. Instead, she feels turned of his lack of emotional strength, emotional maturity and inability to stand on his own two feet without her. She then closes herself off from him even more (e.g. she unfriends him on social media, refuses to talk about him with friends and family, blocks his number on her phone) and focuses on moving on without him. So, if you want to re-attract your ex, make sure that you don’t turn her off by remaining stuck in the earlier stages of grief. Level up by accepting the break up and knowing that you can re-attract her and get her back. He then cuts off all contact with her for 30 or even 60 days and tries to forget her. Yet, he doesn’t forget her. He misses her pretty much the whole time. Then, after a few weeks or months, he gets back in touch with her, only to be shocked when she tells him that she’s moved on and is enjoying single life, or is in a new, committed relationship and is in love. He then plummets back into the earlier stages of grief because he’s lost her all over again. All that waiting achieved nothing. When a woman breaks up with a guy, it’s usually because she’s lost touch with her feelings for him and is thinking that she wants to move on without him now. So, if he then disappears from her life before re-attracting her and making her want him back, it’s unlikely that she will miss him or want him back. Instead, she will focus on getting over him by moving on with her life. Even if she does still care about him, if she doesn’t hear from him for a long time, a woman will usually assume that he has moved on, so she will lose interest in waiting around for him. She will aim to make herself feel better by sleeping with a new guy, or getting into a new relationship and falling in love. This is why, if you want your ex back, you shouldn’t waste a lot of time ignoring her while you slowly work your way through the stages of grief. What’s important to realize is that your grief will instantly vanish when you get her back. That is the ultimate cure. Yet, that will only happen if you interact with her and reawaken her feelings for you. Most women do not come back to guys that they’re no longer attracted to. If you want her back, re-attract her and reawaken her feelings. If you don’t want to do that, then start getting over her and move on without her. Sometimes, a guy will turn to his ex for emotional support even though they are broken up. For example: He might call her on the phone and cry to her about how sad, lost and dejected he has been feeling since they broke up. Alternatively, he might talk about how he has been getting into trouble at work because he hasn’t been able to focus. She is on his mind all the time and he just wants her back. Yet, what a guy like that usually doesn’t realize is that his needy and emotionally weak behavior is just adding to her reasons to remain broken up. A woman doesn’t want to be a guy’s therapist or counselor and help him cope with challenges in his life. If they are friends, then fine, she will do that. Yet, when it comes to a sexual, romantic relationship, a woman wants to be a man’s girl, not his counselor. She wants him to be emotionally strong enough to handle his problems on his own, without her having to hold his hand and repeatedly tell him that everything is going to be okay. So, when a guy turns to his ex for help in easing his feelings of shock, anger or sadness after they’ve broken up, it makes her feel as though he needs her to be able to function and feel good about himself. He’s not his own man and needs her to support him like a mother would support a son, or a big sister would support a little brother. As a result, she pushes him away, leaving him feeling even more lost, confused and angry by what he perceives as her cold, unloving and even selfish treatment of him. In many cases, a guy’s initial efforts to get his ex back doesn’t work, because he remains in a state of panic, denial, bargaining, anger or desperation. While feeling like that, he’s inevitably going to say and do the wrong things (i.e. be needy, say insecure things), which won’t make his ex woman feel motivated to want to be in a relationship with him. The key to getting your ex back is to make sure that when you interact with her from now on, you displaying some of the behaviors and traits that will naturally attract her to you again (e.g. confidence, emotional strength, emotional masculinity, charisma). The more emotionally attractive you become to her, the less she will be able to resist the idea of giving you another chance. Suddenly, interacting with you will feel good to her again. She then drops her defenses and you can get her back. On the other hand, if you keep trying to get her back while you are stuck in the stages of shock, anger, bargaining or depression, you will probably continue to turn her off. As a result, getting back together again becomes a lot more difficult. So, if you want to make things easy, focus on quickly getting through the stages. Some guys can do it in hours, some within days and others within a week or two. Do you want to speed up the process? If so, continue learning right now.